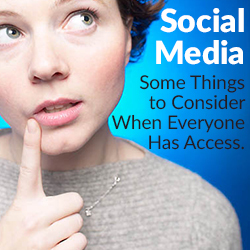 Social Media: Things to Consider When Everyone Has Access. Over the past fifteen years in Public Relations, we’ve seen the changing media landscape impact how our clients communicate with their stakeholders and with the public. For many companies today, social media is no longer an option, but a requirement, and often the first avenue of sharing information with the public. For most consumer and business facing companies, platforms such as Twitter, Facebook, LinkedIn, Google+, Instagram and Pinterest, allow them to direct conversations about their brand, products, and services, control the company’s messages, and reach out to shareholders and stakeholders. As a resource for customer service, social media allows an organization to “hear” how it is perceived, how campaigns and offerings are received, and how to address complaints and suggestions. In crisis situations, social media can be used to quickly share important information and allay concerns. But the ubiquity of social media means that everyone has access, including those who work for, or are affiliated with the organization. Employees frequently have personal accounts on the same social media platforms used by their employers; in some cases employees are encouraged to connect with their organizations, or are asked to follow and like their employer’s corporate accounts. But that social network can also be problematic: companies can’t and don’t regulate how their employees use social media, but an individual’s misuse of the internet can have a lasting and detrimental effect on the organization. Employees might use social media to harass others, engage in illegal activity, or behave badly. Consider the numerous accounts of employees fired over the (mis)use of social media: An employee of a nursing home posted a picture of a patient in a compromised position. A nonprofit worker posted a photo of herself behaving disrespectfully at Arlington National Cemetery. Countless restaurant employees complained publicly about their respective restaurant jobs for everything ranging from uniforms to work hours. Even comedian Gilbert Gottfried, who served as the voice of the Aflac duck, was fired after he posted jokes about the tsunami in Japan – a country which comprises a large customer segment for the insurance company – on Twitter. Almost all of the companies in these instances found themselves caught up in a viral situation potentially detrimental to their reputation as a business, and their relationships with stakeholders including customers, vendors, and shareholders. This “guilt by affiliation” can burden an organization with legal and public constraints for which it might be unprepared. How and when should they respond publicly? Can they legally fire the employee for being offensive if what was posted publicly does not violate conditions of employment (for example, sharing undisclosed financials or intellectual property, sexually harassing others online, etc.). Can and should an employee be fired for being (un)intentionally foolish or reckless? Most companies have strict policies governing how and when their social media team uses their official platforms to convey corporate news. While privacy advocates decry the use of monitoring or regulating of employees’ social media accounts, insisting that freedom of speech should not be infringed, a responsible business should provide to its work force a clear set of rules regarding how personal social media accounts should be used, particularly if the company, its products or services are referred to in any way. When writing these policies, first be aware of the governing state and federal labor laws regarding what is protected in a social media post and what isn’t. Also consider that the Federal Trade Commission requires that any endorsements, reviews or mentions of products where services or payment were provided must be disclosed. Then determine if or how corporate policies overlap – for example, will all H.R. policies such as insider information, harassment, restricted sharing of intellectual properties, etc., – apply, or will only particular regulations? Empower employees and remind them that they are responsible for their own actions, but to be professional, courteous, and transparent, particularly if they refer to company or its affiliates. Provide employees with a subject matter resource if they find themselves in a situation that could potentially spiral out of control – make available to them subject matter experts to help – whether it’s the PR team or the social team responsible for overseeing external communications. While corporate rules regarding the use of social media can’t prevent problems from occurring, they do establish the company’s policies and position on how employees can and should behave with respect to their affiliation to the organization, and allow the employees to support or engage with their employers online. 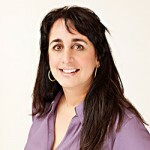 Dina is Partner of Smart Connections PR, a high tech public relations firm headquartered in Rising Sun, Maryland. She has over 25 years of experience in media and communications– as both a journalist and a public relations professional. Dina spent a decade in radio where she enjoyed stints as a news director, radio talk show host, and alternative rock disc jockey, prior to embarking on a career in PR. She and fellow Partner Joanne Hogue established and have managed Smart Connections PR since 2013. Dina holds both a Bachelor of Arts in Journalism and a Master of Arts in Communication Studies from The University of Rhode Island. Thanks for mentioning the FTC Dotcom Disclosure Guidelines. By requiring us to disclose our relationship, the FTC is trying to make sure people know if someone is affiliated with an organization or product they tweet about and that’s a good thing. It doesn’t really matter if that affiliation is professional or personal. So if you’re posting about how great the cupcakes you just ate are, and they’re baked by your employer or your mother-in-law, we’re supposed to tell people that when you post or share on social networks. The logic is people should be able to fairly evaluate credibility when someone tweets or Facebooks about an organization or a product they’re involved with. If the answer could be yes, you’re always going to be better off disclosing.